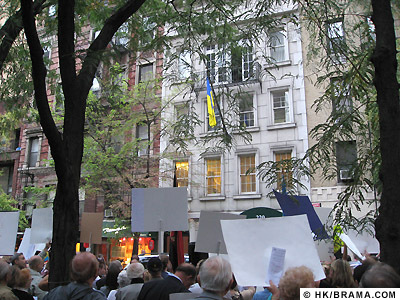 Protest in New York City at the Permanent Mission of Ukraine to the United Nations, 9/22/2010. New York, September 23, 2010  Yesterday evening, Tuesday, September 22, protesters gathered in front of Ukraine's Permanent Mission to the United Nations on East 51st Street in New York City. Estimates range around 200 at any given time, although with people flowing in and out, the numbers were more likely as high as 250-300. The gathering was organized by the Ukrainian Congress Committee of America (UCCA.org) as a protest against actions taken by Ukraine's president, Viktor Yanukovych, that they say compromise Ukraine’s national identity and sovereignty. Mr. Yanukovych was in town for the United Nations Summit on the Millennium Development Goals (MDG). Beginning at 5:30 p.m. and lasting for two hours, protestors chanted, sang, and gave speeches. New York City allocated and cordoned off space for the protesters in the street, although it was tight, and there were plenty of uniformed police patrolling the area. No representatives of the Mission came out to acknowledge the group, and except for a shadowy figure obscured by a curtain, no one made any appearances in the four-story building's windows. Only an open window on the top floor hinted at the possibility that anyone was listening. the non-block status of Ukraine which threatens Ukraine’s EuroAtlantic integration and future NATO membership. With respect to the third bullet point, the Holodomor (the deliberately imposed famine of 1932-33) section was just reinstated on the president's website. However this is looked at skeptically as an attempt only to temporarily assuage the increased displasure with the current president of Ukraine and his government's actions. Many analysts describe the previous president, Viktor Yushchenko, as being ineffectual, corrupt, and having lost opportunities to strengthen Ukraine's economy, but is acknowledged as a leader who propelled the country toward democracy and freedom. Recent news about arrests of scholars in Ukraine and the disappearance of a journalist suggest that Yanukovych's current policies have reverted to authoritarian and repressive ones practiced by the communist regime of USSR days. Ukraine declared its independence from the Soviet Union in 1991. Yanukovych has apparently taken notice of the attitudes toward him, not only by reinstating the Holodomor pages online, but also by responding in writing to the UCCA. In a letter dated 9/20/2010, as reported by the Kyiv Post (published on the president's website), Yanukovych said that he "wants to have a constructive dialogue with all members of the Ukrainian diaspora." 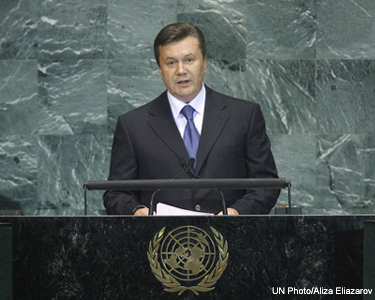 WEBCAST Statement by Viktor Yanukovych, President of Ukraine at the UN Summit on the Millennium Development Goals, 9/22/2010 [select 'Russian' for the Ukrainian language webcast].